I know this may sound incredible, but we keep finding kids on the street who need food and shelter. Fortunately we made a new friend from Chuck’s Bible study, a pharmacist, who has a tender heart for the homeless children hanging out at the bus station. He watched them for several weeks as they begged for pennies to buy food and to pay a guard 2 birr (equal to 10 cents) to watch over them as they slept at night. 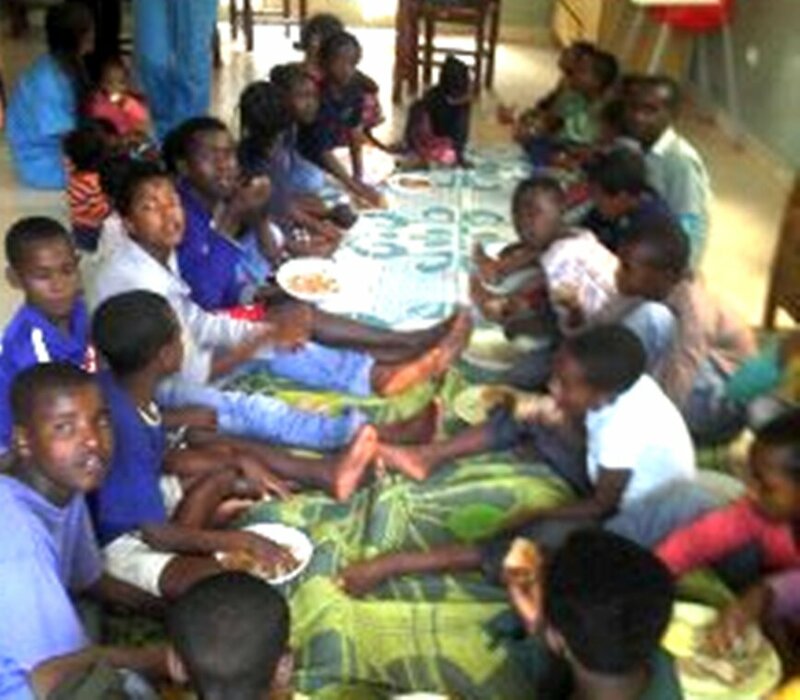 Our friend Teko asked us if we would help him out to provide shelter and food for 8 of these street kids. Not only do these kids need shelter and food, but mattresses, clothing, books and school supplies… just the bare minimum. So we supplied the best we could and on September 27th he rented and opened a house. A simple mat covers the unfinished cement floors and the bathroom is not yet functioning but compared to the hard dirt and the street for a toilet, it’s paradise to these boys ages 8 to 15. Teko enrolled them in a Christian school and has been teaching them Christian songs and stories. Last Sunday at our children’s church at the orphanage, 7 of the 8 boys asked Jesus into their hearts for the first time. Today Teko is taking them for long needed haircuts and giving them donated used clothing. You can see them in this picture gathered together for lunch at our kids church where we all eat injera and wat along with the street boys from Bright Light Ministry and Ebenezer Grace Children’s Home.